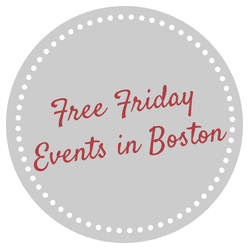 Free Friday Events in Boston for Friday, August 7, 2015! Every Friday in Boston this summer, there’s so many fun and free things to do thanks to the Highland Street Foundation’s Free Fun Fridays, Free Outdoor Movie Series, Free Music Series and much more! Here’s all the free fun that can be had for Friday, August 7, 2015! Free Yoga with South Boston Studio: Free 45-minute yoga class on the Rose F. Kennedy Greenway every Friday at 12:15pm this summer. November Project: Free fitness on Friday mornings at 6:30am. Did I miss any of your favorite free events happening this Friday in Boston or beyond? Hope you have a great Friday!